This film arrives with not the best of buzz – it debuted to some pretty poor reviews at last year’s Toronto Film Festival, contributing to a current 47% rating on Rotten Tomatoes, and was at the centre of a controversy regarding the IMDb ratings system, with a suspicious amount of people rating it one star out of ten on the website without having even seen the film, which was soon linked to a negative campaign by deniers of the film’s real-life subject matter, the Armenian Genocide of the early 20th century. It was a brutal crime against humanity that to this day the Turkish government refuses to acknowledge, and The Promise now appears to be the latest victim of their ongoing war against Armenian citizens – which is a shame, because not only is the film surprisingly not as bad as it was said to be, but it’s actually a very strong and extremely well-made movie that has the look and feel of a classic Hollywood epic, which should be taken as a serious compliment. It is set amidst the backdrop of the fall of the Ottoman Turk Empire, just as the First World War breaks out, and when Armenian medical student Mikael (Oscar Isaac) travels to the Turkish capital of Constantinople – later renamed Istanbul – to study medicine, thanks to a dowry given to him as a result of becoming betrothed to a woman from his village. Upon arrival, he meets Parisian-born Armenian Ana (Charlotte Le Bon) and her American lover Christopher Myers (Christian Bale), who is a reporter for the Associated Press, and before you can say “love triangle” that’s exactly what seems to develop as Mikael develops intense feelings for Ana. However, once the Turkish revolts against Armenian citizens begin, all three of them find themselves caught up in the inhumane refugee crisis, while struggling to find a way to be together despite everything. Of course, this being a major Hollywood film with quite the budget behind it, there is certainly a hint of romanticism in this depiction of a real-life humanitarian crisis, particularly with the central love triangle aspect. It is a dramatic plot point that always seems to be the go-to template for big-budget historical epics like Titanic, Pearl Harbour and others, and it’s easy to see why some people are so put off by this template nowadays because it has become something of a cliché, the classic “man or woman caught between two lovers during a major historical event” trope. But when that sort of thing is done well it becomes less frustrating, and honestly The Promise works with this dramatic angle quite well, because the actors – particularly Isaac and Le Bon – have great chemistry with each other, enough to make you want to see these people hopefully end up together, and individually they make you really care about them and want them to make it out with their lives intact, especially Isaac who is just about great in anything he’s in. Sure, it can get a little soapy at times, but the actors sell it so well that you’re with them all the way through. It also doesn’t shy away from being just a fantastic movie to look at, with some good cinematography and luscious production design all being extremely gorgeous to watch. The film’s $90 million budget was largely financed by Armenian-American billionaire and former head of MGM Kirk Kerkorian, who died shortly before the film began production, but whose hefty investment in the film is right up there on the screen for us all to watch. You can tell the money went into making the film look as grand and as epic as director Terry George realistically could, and it certainly gives off that impression thanks to, once again, some impressive technical aspects such as the sets, costumes, locations etc. So, whatever you may think of the movie, you can’t deny that it’s an extremely well-made one. Most importantly, however, the film represents a dark period of Armenian history with the respect and dignity that its numerous victims and survivors deserve, and for a big-budget Hollywood film to highlight these historical atrocities, which again to this day the Turkish government refuses to admit even happened, is admirable in its never-ending quest to appear more diverse and willing to tackle foreign subject matter instead of staying within its comfort zone. It is bound to please many humanitarian activists eager to highlight the cause for an unfamiliar public, not just because it is a film that presents the issue as the kind of inhumane slaughter-fest that it sadly was, but because it’s a strong and exceptionally well-made movie that’s got some great acting, stunning production values, and even does the tired “love triangle amidst historical event” trope justice, as in it’s not completely awful or even really that badly done. 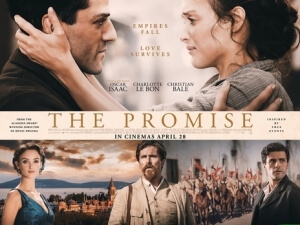 Unlike the countless amounts of people who rated it so low on IMDb without having even seen it, I rate The Promise fairly high after having actually seen it, and highly recommend it to anyone wanting something close to the kind of classic Hollywood epic they know and love. The Promise is a well-intentioned historical epic that hits enough right notes for it to pass as a fairly solid film, from great acting by the likes of Oscar Isaac, to fantastic production values that use up every bit of its $90 million budget, and respectfully highlights its subject matter despite the inclusion of a tired love triangle trope that could have been much worse.